Collects and stores general waste and waste oil. REYNOLDS Engineering Services has released an FOD station that addresses the problems associated with existing FOD/waste collection points at aircraft boarding gates and parking bays. The station facilitates the separation of general rubbish and the correct disposal of un-needed jet oil, oil residue and empty oil cans in a clean and safe manner. The general waste and empty oil cans are collected and stored in standard, 120-litre Sulo wheeled bins, while the waste oil is collected in the integrated 75-litre oil tank. 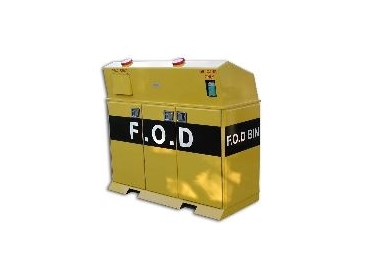 The FOD station addresses OH&S, fire safety, security and environmental pollution issues. The incorporation of an internal bund tray means any oil spills or overflows are contained within the unit and are easily rectified. Dual-purpose vents on the cabinet top allow access for both fire extinguisher hoses and camera and gas detection equipment. The unit has lockable doors and top for restricted access and reduced possibility of tampering. The oil overflow containment feature has a capacity of about 15 litres. An oil level sight gauge is optional. The system uses weather-proof, corrosion-resistant, high-durability fireglass cabinet. It is easily moved with a forklift. The removable cabinet top has a sloping profile to discourage placement of material on the surface.